Jayme Buck and Callie Inman - we are both from Burnsville. We make game day inspired clothing for women, with a Minnesotan twist! We have been best friends for what seems like forever . . . since second grade! In our adult life we have always supported each other in following our dreams but have talked consistently about wanting to create something together. A little less than a year ago (the night of the Minneapolis Miracle!) we decided to get serious and we planned on meeting for coffee every Monday morning for some brainstorming sessions. After a few trials and errors, we came to the conclusion that women simply don't have enough trendy options for sporting events and we wanted to fill that void. We are inspired daily by women that are willing to get outside of their comfort zones and live a life they have imagined for themselves and are willing to put in the work to get what they want! Our favorite part about what we do is being able to do it together! It has definitely been a transition for us to move from "best friends" to "best friends and business partners" but I think that we see more and more potential in each other, and what we're capable of together, every day. We are both very driven and passionate individuals and we love seeing both of our strengths come to the table to create what Fan Girl has become. Our least favorite part of the maker process is the room for human error. Since we make everything handmade there is always space for mistakes which can be extremely frustrating. We pride ourselves in the quality of our product, so any product that turns out less than perfect we won't sell. However, because everything is handmade, we love the creative independence we have in the makers process. A day in the life consists of ordering our products and designs and creating inventory to fulfill our online orders as well as wholesale orders and products for influencers. If we're lucky, we both have the day off from our full time job and can tag team it together! We are also always brainstorming new products and bouncing ideas off of each other so we can keep Fan Girl fresh and exciting. Entrepreneurship is a daily grind, but we love doing it. We both work full time jobs that we love apart from Fan Girl. Jayme is a Nurse at the University of Minnesota's Neonatal Intensive Care Unit and Callie is flight attendant for Delta Airlines. Aside from our crazy schedules we love to travel to new and exciting places and eat good food! We are both very active and love a good run, workout, or hike. 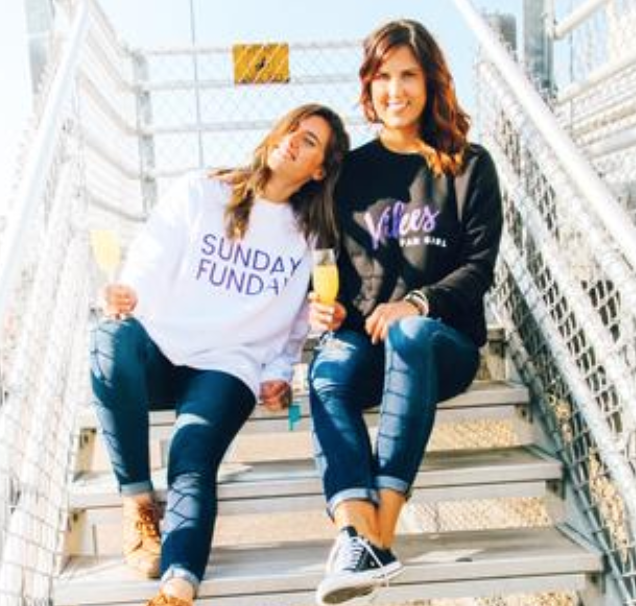 And of course on Sundays you can find us having a mimosa and cheering on our Vikes!